Two essential parts of the solution needed to achieve personized medicine are having tools to efficiently merge diverse data sources into Integrated Health Information and being able to leverage all available data through third generation segmentation to find the factors that differentiate who responds to what. 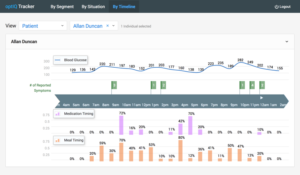 optIQ Tracker fills this gap, empowering informaticians to find the segmentations that differentiate response, identify the therapeutic options that work best in each situation and engage both physicians and patients with integrated views to track their progress. eLumindata works with companies that have key products not achieving the full growth potential they believe is possible. Insights from advanced segmentation and next generation promotion response modelling help teams view the market at a deeper level, which can lead to more effective targeting, message refinement and bringing the most valued information and services to individual customers. Impact from acting on these insights often can be seen quickly in increased sales. eLumindata can help teams launching new products maximize the likelihood of success through understanding and tracking early, mid-stage and late adopters. By rapidly seeing how each segment is responding to the product, the team is empowered to be unusually agile and efficient in achieving early and sustained market acceptance. Conversely, eLumindata also can help teams track and be unusually agile and effective at responding to competitive launches. For teams looking to match the right promotional messages, offers and services to motivate customers, eLumindata’s advanced segmentation analytics software can provide clear insights to help. In a real situation, eLumindata helped a client who had been using all messages equally with all groups of customers recognize which groups were most responsive to each, and how to avoid negative impact from a message that scared part of their audience. The maxim says that real estate is about location, location, location. eLumindata provides hyper-local analytics to help real estate professionals and their clients find the right marketing and pricing strategies for their specific neighborhood and price range. 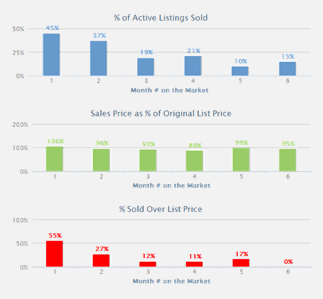 In two companies, agents who used eLumindata’s software regularly increased their closed sales volume on average by over 50% in less than a year. To deliver business impact fast, eLumindata typically begins by working closely with clients to identify short-term wins. eLumindata then provides the software and training to empower clients to get answers and insights quickly and inexpensively. eLumindata’s tools can access data in a variety of formats, including databases, spreadsheets and XML tables. Uploaded data are stored on secure cloud servers managed by Rackspace or can be maintained on private servers within a company’s firewall. Results easily can be fed directly into other tools for presentation or further analysis. When data are exported into Excel you can get not only the results, but also the underlying data, making it easy to verify and explore further. Underlying eLumindata’s products’ power to make analysis simple is unique software that can take a request, automatically determine the best available source or combination of sources to provide the data, execute queries, combine the data and summarize the results. Even if numerous steps involving extensive data wrangling is required, the results usually appear in under a minute.